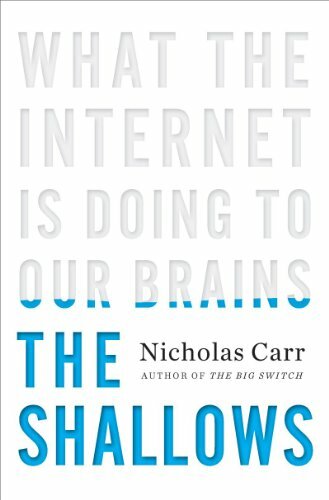 Last Friday afternoon, as I was leaving my house to en route to the airport with the family for a short vacation, Nicholas Carr’s latest book, The Shallows: What the Internet is Doing to Our Brains, arrived in my mailbox. I grabbed it, jumped in the car, flipped it open during the drive to Dulles Airport (don’t worry, the wife was driving), and began devouring it. I say “devour” because once I started reading it, I didn’t stop. I was wholeheartedly absorbed in the text from start to finish. But Do the Costs Really Outweigh the Benefits? Whatever you think of the thesis Carr sets forth in The Shallows, the book is just so beautifully crafted that it commands your attention. As I pointed out in my review of his 2008 book, The Big Switch, Carr is a massively gifted wordsmith. He is up there in that rarefied air with the likes of George Gilder, Peter Huber, and even the late Ithiel de Sola Pool. These are technology writers who make your revel in their ability to weave a gripping narrative and turn geeky tech talk into sheer poetry. Rich with historical anecdotes and replete with scientific surveys and evidence, The Shallows is a book that demands your respect whether you are comfortable giving it or not. And many people won’t be. After all, Carr is a bit of a skunk at the cyber-garden party. I mean, how dare he suggest that all is not wine and roses with our glorious new world of instantaneous connectivity, abundant information flows, and cheap (often free) media content! Obviously, most of us want to believe that all adds up to a more well-rounded worldview and greater wisdom about the world around us. Carr is skeptical of those claims and The Shallows is his latest effort to poke a hole in the cyber-utopian claims that sometimes pervade discussions about Internet. But the ultimate question is: Do the costs really outweigh the benefits? Is it the case that these technologies “turn numb the most intimate, the most human, of our natural capacities—those for reason, perception, memory, emotion”? (p. 211) I think that goes a bit too far. I’ve referenced Carr’s work before in my writings on the great ongoing debate between Internet optimists and pessimists. I’ve noted that, generally speaking, you can divide a great number of recent Internet policy books into one of those two camps. Although I’ve penciled Carr into the pessimist category, that’s probably a bit unfair since he doesn’t exude the rabid, neo-Luddite, hot-headedness of some of the other pessimists out there. At the far extreme on that pessimistic spectrum you find Lee Siegel and Mark Helprin, and to some extent Andrew Keen on his grumpier days. Jaron Lanier can get pretty grumpy, too, but he is a bit more toward the reasonable center, although still tending toward the pessimistic side. And you’d find Carr floating about there on the spectrum as well. If my own position is one of “pragmatic optimism,” you could call call his position “pragmatic skepticism”: It’s not the deep-rooted, antagonistic sort of “against-the-machine” hyper-pessimism of some of those others I just mentioned. I like that analytical framework, but it fails to capture the moral or philosophical overlay some of those other Net skeptics / pessimists bring to the table. Nonetheless, students of this debate may find Carr’s reformulation of this intellectual debate more sensible than my simplistic “optimists vs. pessimists” construction. Anyway, let’s return to the question of whether the Net’s benefits justify the costs of the information overload it creates. Carr acknowledges that every technological revolution entails some gains and losses for society and humans, but he is obviously preoccupied with the negatives here. The problem is, there’s just no scientifically precise method of stacking gains against losses. Many others, of course, have discussed the gains in greater detail. Clay Shirky, Jeff Jarvis, Yochai Benkler, Don Tapscott, and many others on both sides of the political fence have played up the Net’s many benefits for society. For me, the crucial question that these scholars have asked is: Were we really better off in the decades prior to the rise of the Net? Did we really read more and engage in the more contemplative deep-reading and thinking that Carr fears we are losing because of the Net? That’s where Carr loses me and where Clay Shirky’s insights about “cognitive surplus” become relevant. Shirky has reminded us that most of us were busy watching “Gilligan’s Island” and “The Partridge Family” back in the day, not reading War and Peace. Shirky recently noted in Wired that, “Someone born in 1960 has watched something like 50,000 hours of television already. Fifty thousand hours — more than five and a half solid years.” So count me among those who think that—whatever most of us are doing in front our our computers most nights, and no matter how distracting it is—it has to be better than much of the crap we wasted our spare time on in the past! However, here’s an interesting question: Could it be possible that both Shirky and Carr are correct? I think so: We are living in a world where we have access to more and better forms of informational inputs than ever before (as Shirky suggests), and yet precisely because of that we have become a bit more scatter-brained and distracted (as Carr fears). In the end, however, while I can sympathize with many of the concerns Carr raises in The Shallows, I just can’t bring myself to believe that we are somehow worse off than we were in the “good ol’ days,” whenever those were, exactly. But, even if Carr doesn’t quite convince me that the Net is turning our brains to mush, he makes a compelling case for what John Freeman, the author of The Tyranny of E-Mail, has called “slow communication” (i.e., more contemplative reading and learning). I would, however, had liked to have seen Carr offer up some personal suggestions for how we each might better manage cognitive overload, which can be a real problem. I have talked here about my attempts to strike a more sensible balance between my online and offline lives. After my two kids were born, I became acutely aware of the need to take more “digital sabbaticals” or a weekly “technology Sabbath” (i.e., a day or at least evening entirely away from digital gadgets and the Net). I now try to find specific moments each day to shut the lid on my laptop, toss my mobile phone in the drawer, and turn off all my other digital gizmos and gadgets and just go do something terribly old-fashion or archaic. Alas, the struggle continues. Even when I swear off digital gadgets or connectivity for a few hours, I still find myself sneaking a peak at e-mail traffic piling up on my phone. In a brief “digression” chapter entitled “On the Writing of This Book,” Carr does mention some of the steps he took personally to make sure he could complete The Shallows without being driven to distraction by the Web and digital technologies. But he doesn’t dwell on that much, which is a shame. One of the things I liked about Freeman’s Tyranny of E-Mail is the way that he closed the book with ten sensible recommendations for getting email communication and clutter under control. A bit of a self-help can go a long way toward alleviating the worst forms of cognitive overload, although it will continue to be a struggle for many of us. Carr should have offered some constructive advice in the book instead of just adopting such a hopelessly defeatist attitude. Many of us would agree with Carr’s plea that, “We shouldn’t allow the glories of technology to blind our inner watchdog to the possibility that we’ve numbed an essential part of our self.” (p. 212) But we also shouldn’t lose sight of how — when properly managed and assimilated into our lives — those technologies really can do glorious things for us. You need to meet us half way, Nick! Despite the reservations I’ve raised here, Nick Carr’s The Shallows is my early favorite for the most important info-tech book of the year [here are my 2008 & 2009 choices], although he’ll have stiff competition coming later this year from Tim Wu, Evgeny Morozov, Clay Shirky and others. Back in 2008, I named Carr’s previous book, The Big Switch, as runner-up for info-tech book of the year behind Jonathan Zittrain’s The Future of the Internet and How to Stop It, but that’s because Zittrain’s book is probably the most important of past decade. The Shallows, however, transcends The Big Switch in many ways and it will be required reading for many years to come. I recommend you read it. All of it. Slowly.